Toasting pumpkin seeds, that hallmark of Halloween, are a ritual in our home just as it is in many American homes. We head to the pumpkin patch, a pitiful display of twenty or thirty pumpkins organized with military precision into uniform rows, but it’s all for charity – a way to spend a little extra to support the parks and rec department’s scholarship fund. We each pick out a pumpkin to carve for Halloween. My son chooses the biggest, fattest pumpkin; my husband chooses a modest round one. Me? 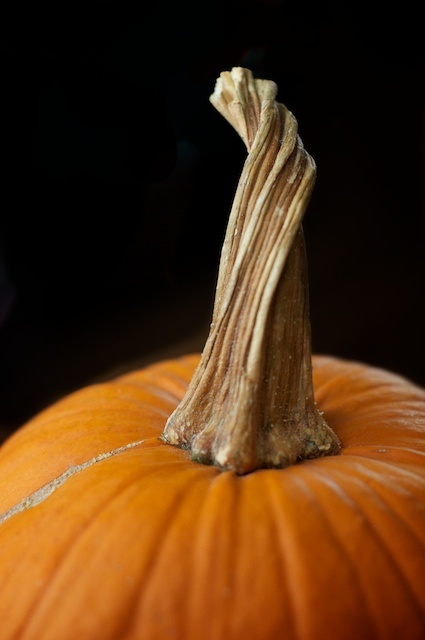 I like the pumpkins with wizened and gnarled stems. 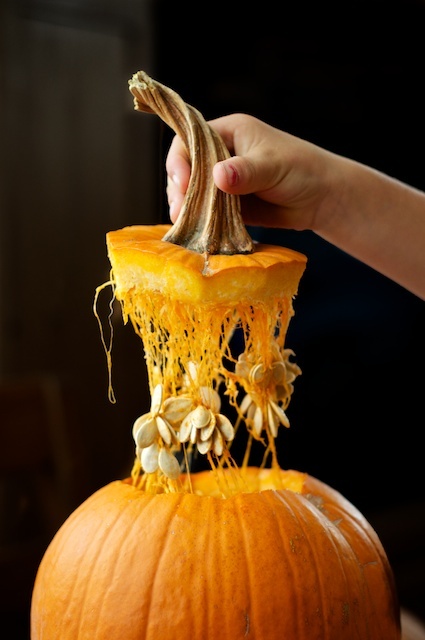 We choose our pumpkins, bring them home and admire them before slicing them open and scooping out the seeds. Try as might, I can never seem to clean each pumpkin thoroughly. There’s always spoonfuls of stringy pumpkin guts clinging to their interior walls. But beauty lies in imperfection. While my son loves the jack o’ lanterns’ naïve, spooky faces, the pumpkin seeds themselves are my prize, and each year I season them a bit differently. 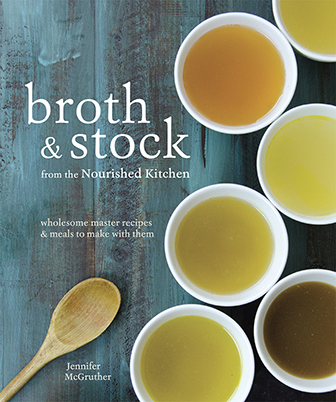 (Click here to go straight to the recipe). It’s a long tradition in my family, just as I imagine it’s a long tradition in yours as well. One of my earliest memories is that of toasting pumpkin seeds. I couldn’t have been more than five or six at the time, and we carved out the pumpkins. My mother flavored the seeds with oil, cayenne and seasoning salt and roasted them in a hot oven until their spicy, earthy scent filled our home. I ate as many toasted pumpkin seeds as I could – until my tongue burned with the heat of cayenne. They’re even better than candy corn, you know. 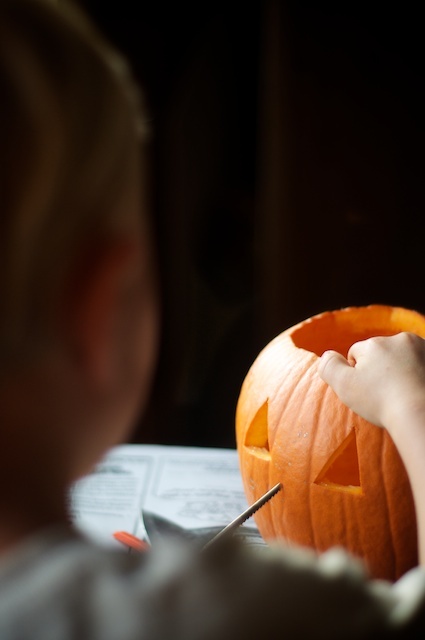 Of course, if you raise your child like I do mine – avoiding candy and sugary sweets where you can, perhaps you should let the Candy Fairy know she should visit your home Halloween night. She’ll whisk away all that nasty candy – the tootsie rolls and jawbreakers, the lollipops and caramels, the pixie sticks and twizzlers – leaving behind a special toy she knows your children will positively love. She visits our house a few times a year – after Valentine’s Day and Easter, and sometimes after friends’ birthday parties. Or pack up all those sweets and visit your dentist – he or she might just buy that candy at one or two dollars per pound. 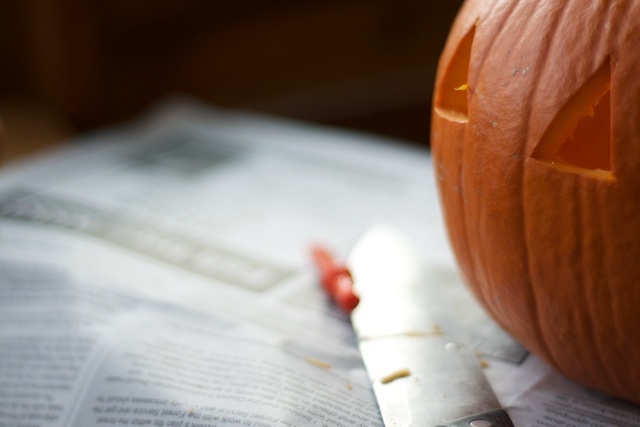 In our home, we steer Halloween celebrations away from candy and sweets toward costumes, spooky stories, cultural history, pumpkin carving and, of course, toasting pumpkin seeds. Pumpkin seeds are a beautiful food – earthy in flavor and rich in nutrients, particularly trace minerals. Just a single ounce of roasted pumpkin seeds contains about a quarter of the required daily value for iron, a third for both magnesium and phosphorus and nearly 42% of the required daily value for manganese1. Pumpkin seeds are also rich in zinc and vitamin K1. Of course, without proper preparation, all those minerals do surprisingly little good. Pumpkin seeds are extraordinarily rich in phytic acid2, an antinutrient that binds minerals in the digestive tract preventing your body from fully absorbing these vital micronutrients. Of course, proper preparation of all seeds, nuts, legumes, beans and grains including pumpkin seeds helps to mitigate the effects of these mineral-blocking antinutrients, enabling your body to better absorb the full complement of minerals contained in these wholesome, natural foods. The simple tasks of soaking (as called for in this recipe), souring or sprouting facilitates the degradation of antinutrients in cereal grains3 as well as nuts, seeds and legumes, making these foods that much better for you. 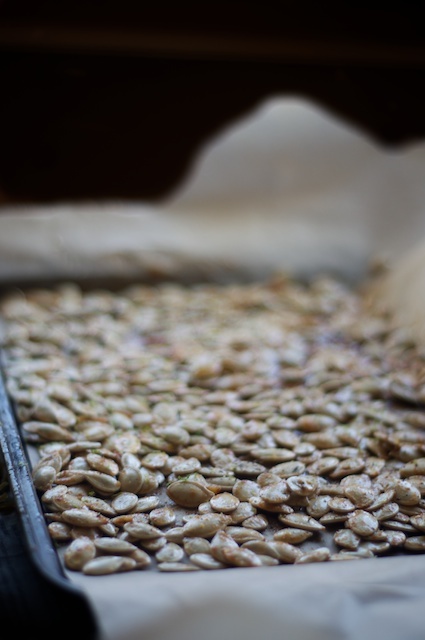 The Weston A Price Foundation, a nutritional advocacy group, recommends a long period of soaking coupled with roasting to improve the nutritive value of pumpkin seeds2. Beyond a high mineral content, pumpkin seeds offer further benefit. The seed is rich in the amino acid L-tryptophan4. Tryptophan shows some promise in the treatment of anxiety disorders, and a recent pilot study analyzed the effects of tryptophan derived from gourds, like pumpkin, and found that a treatment coupling tryptophan-rich gourd seed with carbohydrates significantly improved anxiety levels among the subjects over a period of just two weeks5. The same researchers also found that Tryptophan-rich seeds coupled with carbohydrates also reduced insomnia and waking time in the night6. Crunchy, salty and spicy with a hint of acidity, these toasted pumpkin seeds are a favorite treat at Halloween. Of course, don’t leave toasted pumpkin seeds to Halloween alone; rather, toast the seeds of any winter squash, eliminating kitchen waste and providing wholesome, nourishing snacks for your family. Clean the pumpkin seeds, removing any extraneous pumpkin flesh or strings from them, give them a good rinse then cover them in warm water plus one teaspoon unrefined sea salt for eighteen to twenty-four hours. After they’ve soaked for up to twenty-four hours, rinse them, drain them and pat them dry. 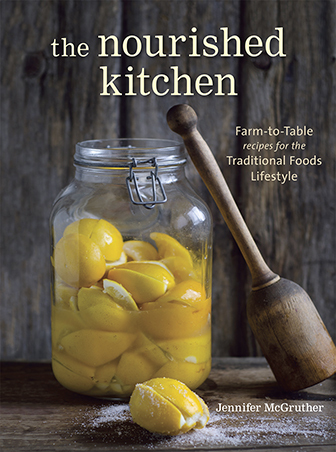 Whisk the white of one egg and one-half teaspoon unrefined sea salt together until frothy, then stir in two tablespoons melted butter, the zest of two limes and up to one tablespoon chili powder. Toss cleaned and rinsed pumpkin seeds in the mixture of egg white, salt, butter and spices until all the seeds are thoroughly coated. 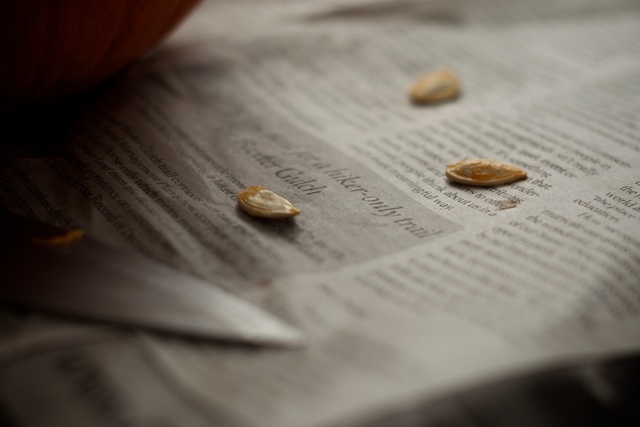 Line a baking sheet with parchment paper and spread the pumpkin seeds in a single layer. Bake in an oven preheated to 450 degrees Fahrenheit for approximately seven minutes, stirring about half-way through. I can be so wasteful with type of thing. This sounds great and really encourages me to give it a try. I’ve pinned and shared on my fb page re link love. Sounds so yummy! I love pumpkin seeds and lime and chili is one of my favorite combinations! Can’t wait to try it. Do you ever sprout the seeds, though? I’m wondering if I should do that right now. Do you peel them and only eat the insides? I was eating the whole thing and my husband told me I shouldn’t do that cuz the peel is hard to digest. Is that true? I eat the skins too, they are nice and crunchy with lots of fiber. When I run out of my own pumpkin seeds, I eat the RAW brand pumpkin seeds. They don’t have their skin, but are still yummie! What is the reasons for using an egg white? I usually toast the seeds with some oil. 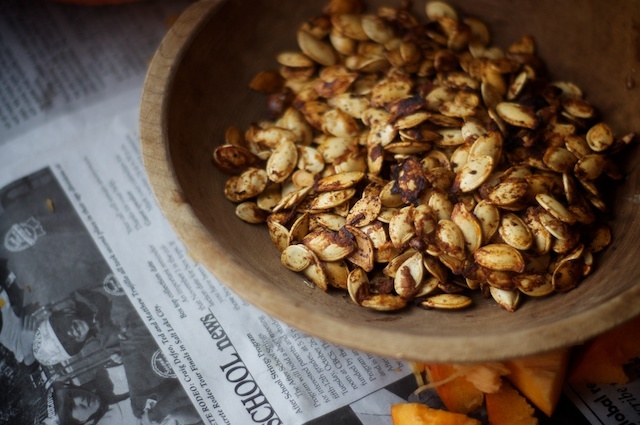 Are the nutritional benefits of pumpkin seeds affected by cooking at high temp? Just curious, as I know almonds are best roasted at low temp.